It’s difficult to pinpoint the moment when spring arrives. It tiptoes up to us, subtle and shy, trying hard not to show itself. And then, before we’re aware of it, everything is changing. Here’s how Todd Nelson described it in the Christian Science Monitor. When does such a moment arrive in our lives, when we feel a gentle shift of weight and the old, ordinary life we’ve been living loosens its grip? When do I stop struggling so hard against the gravity of my mortal nature and trust it enough to start riding with it? When do I reach the point St. Paul described when everything old passes away and everything becomes new, or as Eugene Peterson paraphrased it, “The old life is gone; a new life burgeons” (2 Cor. 5:17) – the moment when the sap rises, the seed coat opens, and our true nature is revealed. That moment came for Jesus on the mountaintop when “he was transfigured” and “his face shone like the sun” (Matt. 17:2). Was it a physical change in Jesus or an inner experience in his friends that changed them? There’s no way to know. Maybe Matthew anticipated Emily Dickinson’s advice to poets, to “tell the truth but tell it slant,” so we might catch a truth no words of his could convey. Jesus had just predicted his own suffering and death and had spoken about the costliness of following the life path he’s on (Matt. 16:21-28). Perhaps for the first time now, he knows his death as the real and looming outcome of the way of life he has chosen. And perhaps now, in a moment of intense communion with God, he commits himself to that life at a deeper level. He could have done something else. Knowing the high cost of what lay before him, he could have taken his friends up the mountain and gone over the hill, absconded. He could have given up and settled for an ordinary life with a job and mortgage, a wife and children. He could have become so well adjusted to the world that he fit in with hardly a second thought, living just like everyone else. Or he might have continued the life he started, but half-heartedly, holding back the most precious and essential part of himself, never risking himself totally and so never knowing the wholeness that comes with total commitment. He could have been quiet and unprovocative, more tentative and less passionate. He might have been involved in his congregation, being part of a small class or serving on some committee, dropping into the offering plate whatever was comfortable without ever reaching the point of sacrificial giving. But being simply involved in that way is the safe way in life, the partial way. It’s the way that looks for a religious system that provides answers and makes the choices for us, so we don’t have to live with the questions and make the hard choices ourselves. It’s the way that settles comfortably for a nod toward religion once a week but never risks make a radical commitment that shapes life day by day. Both of those ways are a living death. Instead, he chose the difficult, costly way of total commitment to the life that lay before him. (You know the difference between being involved and being committed? A chicken is involved in a ham-and-egg breakfast; a pig is committed.) He opened himself so that his true nature, his God nature, could emerge. He uncovered the will of God that lay deep beneath his own will, and he released it into the life that was before him. And it was there, in that moment, when he was transfigured in the eyes of those around him. The weight shifted, and he became his true self, in all his fullness, in all his wholeness, in all his radiant glory. When does the shift toward spring come for us? When does the winter of death loosen its grip on our lives so that we feel our spirits lift? It happens when we make the transforming choice to live from the depths of our being instead of from the surface, when we make the commitment to live radically the faith we profess, to create the life that’s ours to make instead of simply being involved in the life that’s given to us. “So here’s what I want you to do,” Saint Paul wrote to the Christians in Rome, “God helping you: Take your everyday, ordinary life – your sleeping, eating, going-to-work, and walking-around life – and place it before God as an offering. Don’t become so well-adjusted to your culture that you fit into it without even thinking. Instead, fix your attention on God. You’ll be changed from the inside out” (Rom. 12:1-2 The Message). 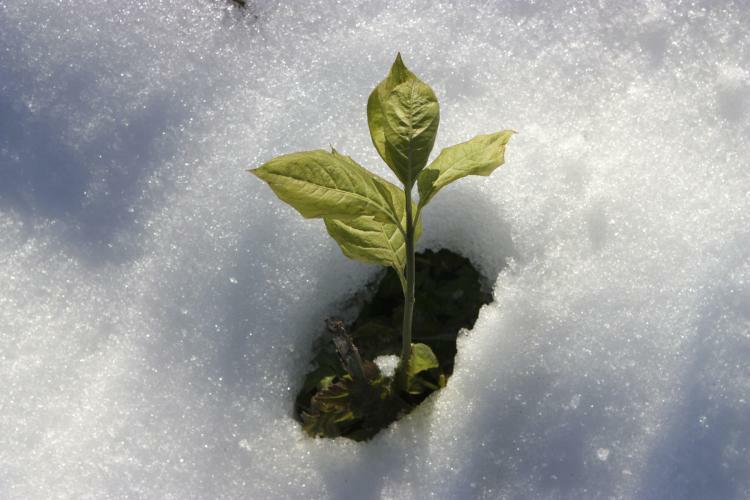 The cold of winter may continue to assail you, but the spring of life will have announced her sure approach.